This vivid, immersive memoir describes an innocent childhood in a terrifying religion. The Worldwide Church of God taught that the Great Tribulation would begin in 1972 and end three years later in a river of fire from which only the Chosen Ones would be saved. Jerald Walker grew up with these teachings looming over his head. In 1975, at the predicted end of the world, he would be 11 years old. 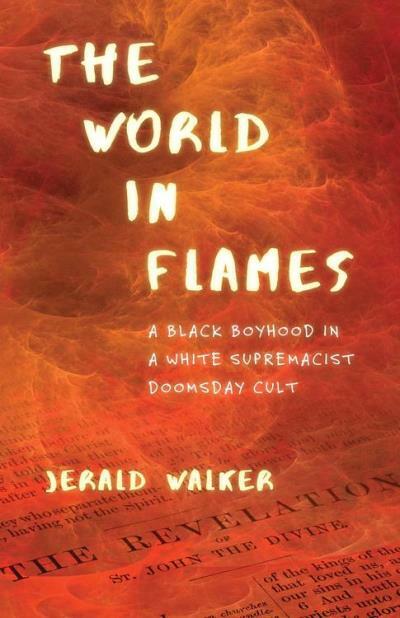 In The World in Flames, Walker relates his unusual upbringing in Chicago as the sixth child of blind African American parents, in the black wing of a church that preached segregation as well as fire and brimstone. Except for a brief prologue and epilogue offering a glimpse of the adult Walker, the whole of this fantastical true story is told from a child’s disarming perspective. Jerry is six when his memoir opens in 1970, and his days are filled with fear. Preoccupied with the coming events and concern for a friend who is not Chosen, he struggles to navigate family secrets, severe corporal punishment and a religion based on threats. As narrator, Jerry is matter-of-fact and innocent about the improbability of his home life. This narrative voice renders an incredible story accessible. Perhaps the most heartbreaking detail is Jerry’s guileless devotion to his church. Walker (Street Shadows) recounts his growth from wide-eyed child to hapless teen, and finally to skeptic, with immediacy and feeling and without offering judgments. His personal history verges on the absurd, but his telling of it is earnest and unadorned, never sensational. The World in Flames is a difficult story simply and gracefully told. This review originally ran in the September 9, 2016 issue of Shelf Awareness for Readers. To subscribe, click here, and you’ll receive two issues per week of book reviews and other bookish news. Rating: 7 lines of scripture recited.